Our recent posts have highlighted some famous figures in the history of the Royal Free Hospital and their links to the library – Elizabeth Garrett Anderson and Sheila Sherlock. This month we’re focusing on the founding father of the Hospital, William Marsden. Marsden was born in 1796 in Yorkshire, probably to humble beginnings. Following an early career as an assistant apothecary, in 1824 Marsden studied surgery under John Abernathy at St Bartholomew’s, qualifying as MCRS in 1827. Late that year, an event occurred that had a profound influence on the direction his life would take. Walking home shortly before Christmas, Marsden found a young girl almost dead from disease and starvation on the steps of St Andrew’s Church in Holborn. He tried to find treatment for her at several hospitals but was refused; at the time admission to hospitals required a letter from a hospital governor, and therefore the power of admission was held exclusively in the hands of the rich who supported the hospital. Distressed at this state of affairs, Marsden called a meeting of city businessmen, and proposed the founding of a free hospital; the ‘London General Institution for the Gratuitous Care of Malignant Diseases’ opened its doors on April 17th 1828. The dispensary treated all diseases and conditions, including venereal disease, which most other institutions were reluctant to treat. In 1832, when cholera reached London, the free hospital opened its doors to cholera patients. As a result Marsden became a leading authority on the treatment of the disease, saving many patients. In 1835, King William IV became a patron of the hospital, and the institution became known as the ‘Free Hospital.’ In 1837, Queen Victoria granted the title of ‘Royal’ to the Free Hospital, bringing much publicity. The Royal Free Hospital relocated to Gray’s Inn Road in 1843, reaching a capacity to admit hundreds of patients. In 1853 Marsden and two colleagues proposed that the Royal Free Hospital was now in the position to start a medical school. 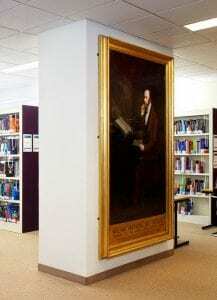 Visitors to the library may notice the impressive portrait of Marsden on the ground floor, painted by Thomas Illidge in 1850. The library is proud to provide a home for this representation of the founder of the Royal Free Hospital and pioneer in social medicine. We hope that our users will also find inspiration in the wonderful history of the Royal Free Hospital that can be found within the Library’s walls. William Marsden. Br Med J, 1, 96. MAGEE, R. 2009. William Marsden, a pioneer in social medicine. ANZ journal of surgery, 79, 918-921. MCINTYRE, N. 2004. William Marsden’s Yorkshire family, 1749-1922. Journal of Medical Biography, 12, 154-160.